Update: We've released the source code in our new blog post highlighting the technical details of Invity. Have you ever come across the situation of inviting many people at once to a wave? For instance, assume you want to share a wave with all your friends or colleagues that are already participants of another wave. As of today, you would have to invite everyone separately to the new wave. In our project, we often found it annoying to invite the same group of people to lots of different waves. We would love to have some kind of group management, which is announced by Google but not yet implemented. However, as a workaround we developed our own solution, which we want to share with you today. 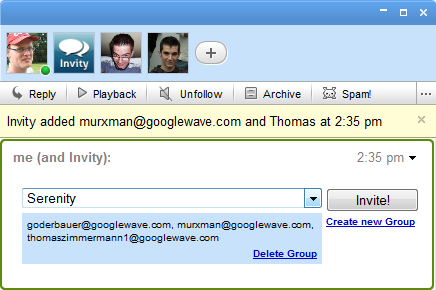 We are happy to present Invity (pw-invity@appspot.com), a Google Wave robot that you can add to your waves. It can save all current participants of the wave as a named group. 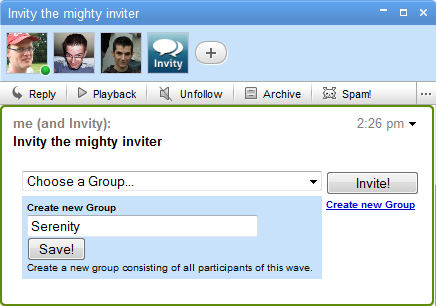 When you create a new wave and invite Invity, you are able to select a group and Invity automatically adds all members to the wave. Later this week, we will publish some insights we gained during the development process in a more technical post. We also plan to publish Invity's source code.